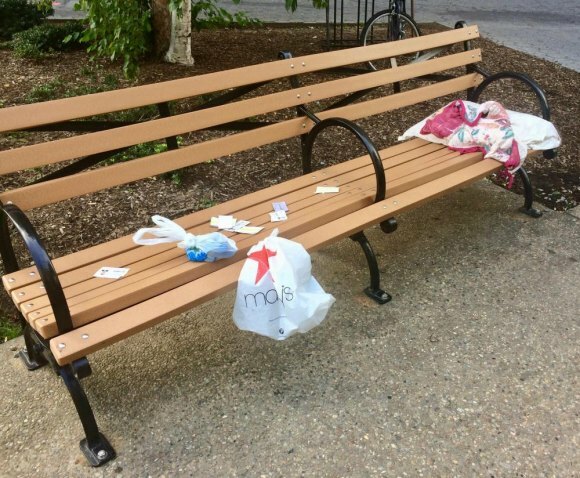 This morning one of the benches in the plaza between 455 and 425 Main Street (closest to the bus stop) was covered in trash, including bags tied to the bench, a wet pillow, and clothing items. At 1:00 pm the bench was still covered in this trash, so I contacted Public Safety, who assured me they will get in touch with RIOC cleaners who are responsible for this area. At 8:45 pm this evening the bench still has not been cleaned up, so I called Public Safety again. When I told our building staff at 455 about this, they were nice enough to volunteer to go and clean it up, instead of waiting for whatever RIOC response will be tomorrow morning. This is a potential health and safety issue, and I would hope to see a more swift response from the corporation that's responsible for keeping our community clean and safe. Further, this is a heavily trafficked area where many families play with their kids, and this kind of situation is not acceptable. I do hope to receive an explanation for RIOC's inaction. Sadly, that complaint came in on Friday morning. I shot the above photo on Saturday at around 1:00. 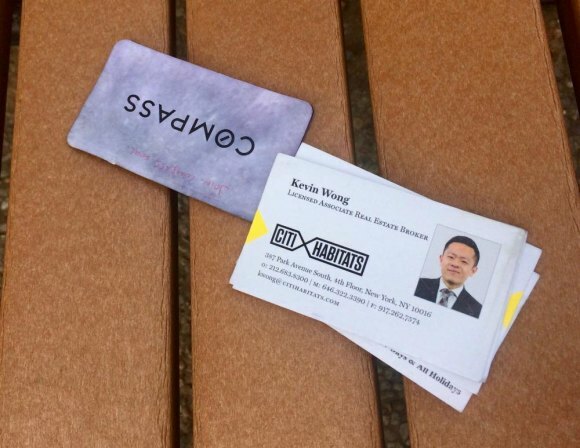 Humorously, though, business cards from real estate brokers were added to the mess. 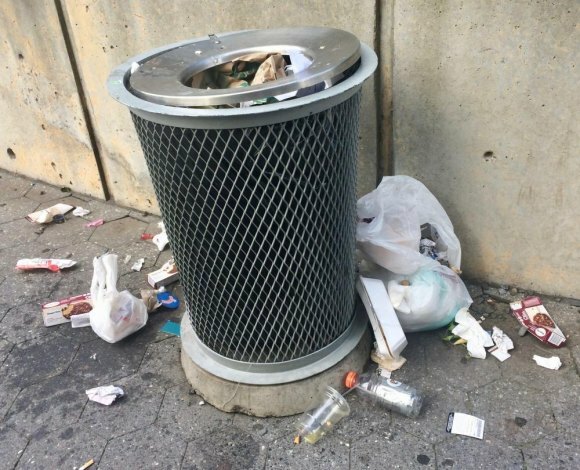 And only 20 yards away, the subway plaza was decorated with trash distributed by a Roosevelt Island resident in search of goodies in the heap. Late afternoon, the situation remained unchanged. With Riverwalk Commons now as depressed with empty storefronts as Main Street, neglectful maintenance seems to have become part of the bargain. Hey, RIOC! Why are you allowing this kind of quality of life degradation on our Island?